Timeshare ownership at Marriott's MountainSide Park City Resort is a perfect example of quality. Located at the base of the Park City Ski Resort, a previous Olympic venue in Utah, this beautiful fractional ownership offers you a prime vacationing destination year round. Regardless of whether you’re looking for recreation, relaxation, or you’re there on business, a Marriott’s MountainSide timeshare can facilitate your needs. When you buy a Marriott’s MountainSide timeshare resale, you will enjoy a spacious two bedroom two bathroom villa. This gorgeous suite is a lockout unit that accommodates up to eight occupants. There’s cable TV in the living room and both bedrooms, and the kitchen comes fully equipped with a microwave and dishwasher. They also provide free high-speed internet access, newspaper delivery, and wheelchair accessibility. This ski in/ski out resort has nine floors and 364 rooms. If you’re looking to buy a Marriott’s MountainSide timeshare resale, you’ll be pleased to know that its onsite amenities are admirable. After a few days of continual fun and excitement you may want to relax at the resort for a bit. You can lounge out by the pool or kick back in one of their heated hot tubs. If you feel the need to work out while on vacation, then you can take advantage of the onsite fitness center. It includes state of the art equipment with a sauna and steam room. After you’ve worked up an appetite, you may want to sit down and enjoy a few drinks and delicious cuisine at one of their nearby restaurants & lounges. There’s meeting facilities available for business services and there are safe deposit boxes available at the front desk for that added level of security. 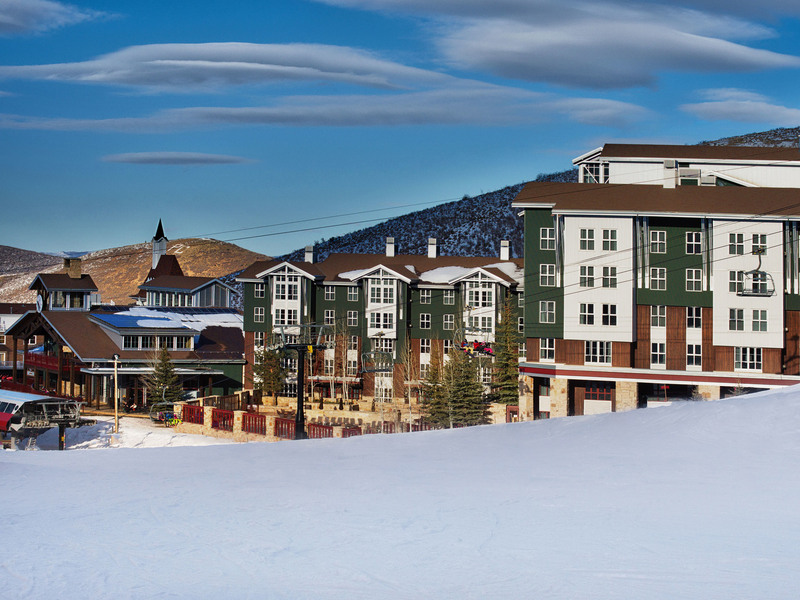 In the winter Marriott’s MountainSide provides a convenient ski check just steps from the Payday Lift at Park City Mountain Resort. As a guest you will also enjoy the convenience of free bus transportation to Main Street, Sundance, and nearby shopping. Depending on what time of the year you decide to vacation, nearby activities include; skiing, snowboarding, snowmobiling, snowshoeing, fishing, horseback riding, jogging trails, hiking, snorkeling, outdoor tennis, water skiing, tubing, mountain biking, cultural events, shopping, and golf. See our Marriott's MountainSide timeshares for sale now! Regardless of what your taste buds are craving, I’m sure that you’ll find that satisfaction is close at hand. If you’re looking to spice things up a bit you can try neighboring Mexican restaurant, Baja Cantina. For a more exotic flavor, experience the superior Japanese food served at Oishi or a Thai flare at Bangkok Thai. For an elegant atmosphere, the choices are endless. Mustang, Riverhorse, Talisker or Zoom would be wise choices. If you’re just looking for a good old fashion American meal, then you can take a stab at Prime Steakhouse and one of their juicy steaks. Other, off Main Street dining recommendations, include Red Rock Brew Pub and Loco Lizard Catina. Marriott's MountainSide Timeshare Ownership; there's nothing else like it. There’s nothing like vacationing at a luxury resort. The quality of services that you and your family will receive is far greater than that of a standard hotel. When you buy a Marriott’s MountainSide timeshare resale, you’re purchasing a little piece of heaven. As you can see, this four star resort offers a wide array of activities that your whole family can enjoy. With Marriott’s MountainSide vacation ownership, you’ll have the option of vacationing at many of Marriott’s timeshare resort locations. A Marriott’s MountainSide timeshare resale is also exchangeable with Interval International, so your vacationing possibilities will be next to limitless. Here at Premier Timeshare Resale you’ll find plenty of Marriott’s MountainSide timeshare deals, and you’ll have piece of mind knowing that you saved thousands of dollars by buying a Marriott’s MountainSide timeshare resale. Are you looking for Marriott’s MountainSide timeshare deals? Sometimes unforeseen circumstances prohibit a family from being able to make use of their timeshare. Instead of letting their little slice of paradise go to waste, they put it up for sale on the resale market. Premier Timeshare Resale is a full service real estate office that specializes in timeshare resale. If you want to buy a Marriott’s MountainSide timeshare resale, or if you want to sell a Marriott’s MountainSide timeshare, Premier Timeshare Resale has the resources to help you and they will never charge you an upfront fee for anything! See our Marriott timeshares for sale.